The above photo, at first glance, looks like a photo from your average concert. But if you look closer, there's some powerful marketing happening here. Every person, the singer on stage, and every member of the audience, has their arm up and is excited about the music they are hearing. 1 - View your customers as a community, and join them. If there is a 'big secret' to how musicians create fans, this is it. Let's go back to the above photo. 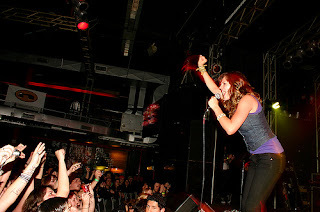 It was taken at a recent concert by The Donnas. But if you look closer, you'll notice that the singer on stage is just as excited and a fan of the music she is singing, as the people that are hearing it. Everyone, the audience, and the singer on stage, has their arms up, and they are cheering. Everyone belongs to the same community of fans. But it's just as easy to join your community of customers in other industries. 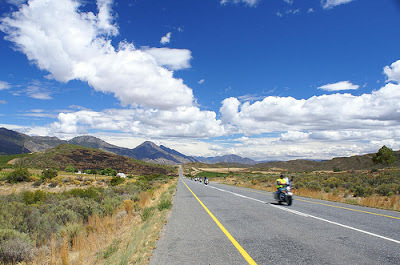 Willie Davidson explains that 'market research' to Harley-Davidson means spending a weekend on the open road with other Harley owners. Davidson is a fellow Harley owner, and as a result, is part of the same culture as his company's customers. The line between Harley-Davidson's customers, and the company itself, is very hazy. Since the company is participating in the customer's community, they better understand their customers, and as a result market to them more effectively. All of this makes it easier for Harley owners to be excited about the brand and proud to be a member of a very loyal and unique culture. 2 - Make sure you view your company and its products as your customers do. Hugh MacLeod had a great point once about making sure that your company is having the same conversation that your customers are. Apple thinks its products are cool, and so do its customers. Remember when the iPhone was introduced? Remember seeing customers proudly camping out for days outside Apple retail stores prior to the iPhone going on sale? Did you realize that in almost every case, there was a Cingular store close by selling the same iPhone, with no one waiting in line? But it was 'cool' to stand in line to wait for an iPhone, at the Apple store. Apple thinks the iPhone is cool, and Apple's customers agree, AND think that THEY are by extension cool because they have an iPhone! 3 - Empower your existing fans to market for you. Another secret to marketing like a rockstar is this: Evangelist=Fan. If you have evangelists, then you have fans. So obviously, you want to find your existing evangelists, and make it as easy as possible for them to tell others about you. Remember this post from last year about how Maker's Mark created their Brand Ambassador program? All the distillery did was organize its existing evangelists and empower them to better market for Maker's Mark. IOW, they made it easier for their evangelists to engage in pre-existing activities. These customers were passionate for the Maker's Mark brand, so the distillery empowered them to market for them. And remember, customers are far more likely to listen to other customers who endorse a product, than they are the company selling the product! 4 - Give customers input into your marketing. Dell's Ideastorm is a great example of this. The company has created a place for customers to not only submit their ideas on how Dell's products can be improved, but they then let other customers vote on which ideas are their favorites. Dell can look and see which ideas are the most popular, and then have a great idea of which improvements/changes customers want to see happen. And when the company acts on the changes that are suggested, it lets Dell's customers know that their input is valued and appreciated. It lets them know that they have some ownership over Dell's marketing. So naturally that leads to more customers giving more input and suggestions on what they want to see, which results in even MORE efficient marketing from Dell! 5 - Have FUN with your marketing! So how is Warner Bros. promoting next summer's hopeful blockbuster movie The Dark Knight? With posters and trailers online, right? Yes they are doing that, but they are also creating websites that must be decoded. If the lucky visitor can do so, they will receive an address of a nearby bakery, where a real cake is awaiting them, with a phone number to call written in icing, and containing a cell phone that receives both calls and text messages from 'Rent a Clown'. This is supposedly a company set up by one of the movie's main characters, The Joker! This is marketing, but it's also a great way to get people talking about, and excited about a movie that won't come out for seven months. And yes, you could argue that it's much easier to create 'fun' marketing for entertainment vehicles like movies and music. But look at this post from Daily Fix about how CD Baby has spiced up the traditionally boring as hell 'thank you for your order' email. They take a mundane marketing activity, and add a sense of flair and show their sense of humor in the process. As you can see from the comments, most people seem to prefer CD Baby's approach! Notice that Ginny even says that she now looks forward to getting emails from them! 6 - Follow the Threadless example. Threadless does a fan-damn-tastic job of marketing like rockstars. With Threadless, their business is their community, and their community is their business. The customers design the t-shirts that are sold, and vote on their favorites. The winning designs are given prizes. The more t-shirts sold, the more money Threadless makes and the more prizes they give away. Threadless' customers are literally marketing partners from the get-go. And the company is thriving because there is no line between the company and its customers. Everyone belongs to the same community, in fact Threadless calls it 'business by accident'. This is something else that musicians understand that many marketers don't. Marketing doesn't have to be a chore and boring for everyone involved. It can be fun, in fact it can be a blast. And the fun factor comes into play when you involve your customers in the process! That excites them and in turn excites you! Passion grows and everyone feeds off that passion. But companies in many industries do great jobs of marketing like rockstars. Think of how many flyers are Nuts About Southwest. What about The Cult of Mac or the fandom that surrounds Harley-Davidson? Hell the Fiskateers are so popular that they get autograph requests at scrapbooking events! Which goes to show that marketing doesn't have to be viewed as just a necessary business function, but instead could be seen as a way to excite your customers into becoming fans. Besides, don't we all really want to be rockstars? 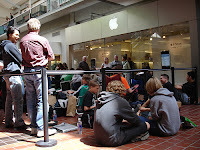 Pic of iPhone line by Flickr user TheQ! Well written, with some good points of view and examples. Blessings of peace for the holidays, my friend. BTW what is it with you guys messing up my name? Toby called me MaRk a few days ago, now it's Mac? Sheesh! Throughout time music has been such a cool phenomenon to culture, society, the arts and yea, marketing! People relate to music and what's more, music inflicts emotion...truly the raddest communication tool, ever. Rockstar's have got it made. "Hey, if you like the donna's check out the sounds ("tony the beat")"
I do like The Donnas, but the main reason why I blog so often about them and Nettwerk artists is because they are the only labels/artists that have gone out of their way to give me access to their music, as well as interviews. So if there's a music angle that I want to write about here, I try to find a way to incorporate the labels and artists that are smart enough to reach out to bloggers and help us. Got to your blog from twitter... As a cluetrainer from way back I definitely liked what you had to say and you gave great examples. It just so happened that 2 days ago my husband and I were in a bookstore and he asked the owner about her t-shirt. It was from Threadless and we both thought it was a great idea - I'm sure we'll be customers soon! I have always promotred the idea of brands as communities, but its a big subject with lots of implications. Some of my thoughts are covered in my blog at thefullblog.wordpress.com and the rest will be in my book (when I get around to finishing it!). meanwhile, here are a few key points that relate to your post. People join them because they represent their views or values. Members also influence them by bringing additional values and views with them. So brands are constantly changing. I have always had an involvment in music and I see where you are comming from with this point. The thing is that bands have always been powerful brands because they are fully interactive. They also have a "face" or faces which means they don't encounter the challenge of personalising the interaction. I just saw this post via today's Get to the Po!nt. I believe every company you referenced is B2C (with the possible exception of Dell who is both B2C and B2B). Do you have examples of B2B marketing that emulates the "rock star" meme? I saw your post via "Get the Point" too ... Love it! You're in my bookmarks bar now. My personal marketing philosophy: Try to be like Tori Amos, never come off as Keith Richards. I think it all comes down to shifting our thinking away from marketing being a 'necessary business function' to instead being a way that we can better understand and communicate with our customers, and if done properly, create evangelists. "I have always had an involvment in music and I see where you are comming from with this point. The thing is that bands have always been powerful brands because they are fully interactive. They also have a "face" or faces which means they don't encounter the challenge of personalising the interaction." Great points Phil, and I think it's worth noting that music artists are also fans of their music. So they are by default members of the community of their fans. There's no line that separates them from their fans, because they ARE a fan of their music as well. We see the same thing with companies. Apple thinks the iPod is just as cool as its customers do. Willie Davidson loves riding his Harley just as much as his customers do. He knows because he rides with them. If you can get to the point where your view of your company is matched by your customers, that is INCREDIBLY powerful. The rock star marketing is so great because of how its emotion. Passion and emotion is the most powerful tool for marketing anything! About 10 years ago, a magazine called Strategies & Business published a piece called "How to "Truck" the Brand: Lessons from the Grateful Dead" (http://www.strategy-business.com/press/article/9095?pg=0). The same year they also published "How Harley Davidson Revs Its Brand" (http://www.strategy-business.com/press/article/12878?pg=0). Great article...an alternative approach to market and get to know your customers. Emotions sales!!! Gail thanks for sharing those articles, both are great! I wanna be a rockstar! But then again, don't we all. Great article and once again it just goes to prove that: it's not what you do, but how you do it! "Great article and once again it just goes to prove that: it's not what you do, but how you do it!" I agree completely, Robert. It's all about attitude. Marketing doesn't have to be a 'necessary evil', it can in fact be a way to create fans of your brand, and to have fun! Take Fiskars, the scissors-maker. They tapped into the power of the scrapbooking community, and launched the Fiskateers movement, which has proven to be wildly popular with scrapbookers, and has increased Fiskar's sales. If you can create fans for a product as mundane as scissors, then it's possible for anything. It all depends on whether you want more fans, or to sell more stuff. What many companies don't realize is, you don't have to make that choice, more fans=more sales. I'm new to this blogosphere world of marketing, and have to compliment you on this post. Love it! I'm a small business owner, and spend much of my time meandering around these sites, trying to figure out how to use what I'm learning. I will, I know it! Great post. I am a newbie to the world of online marketing and this is a great post of ideas to keep in mind for succeeding. Thanks! Great illustration for new online marketers to visualize, grasp, and employ the concepts you've presented. Can you spot the social advertising? Now THIS is how you pitch a blogger! How do you determine a blogger's authority? Have you gotten a pitch like this?